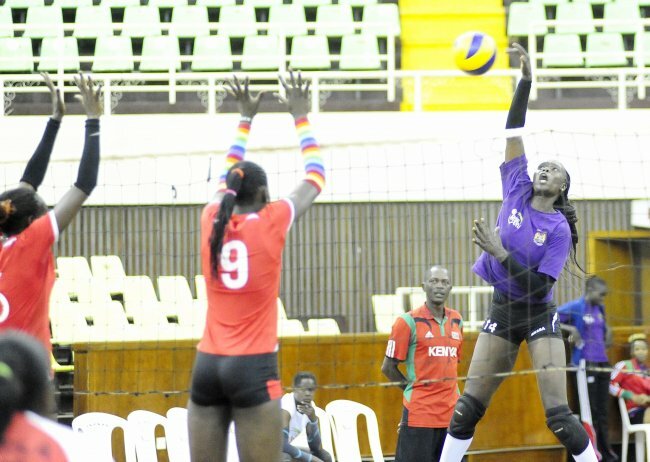 Kenya began their bid for a fourth successive African Women's Volleyball Championship title with a straight sets win over Nigeria. The defending champions proved far too strong at the Yaoundé Multipurpose Sports Complex in Cameroon's capital city as they coasted to a straightforward success 3-0 (25-16, 25-8, 25-10). Elsewhere in Pool B, Senegal beat the Democratic Republic of Congo in four sets- 25-21, 21-25, 25-21, 25-15 to begin their campaign on a winning note. Hosts Cameroon, the bronze medalists last time out in 2015, took on Botswana in today's sole game in Group A winning 3-0 (25-22, 25-11, 25-17). Kenya coach Japheth Munala opted to start the match with skipper Mercy Moim, former captain, Brackcidise Agala, Edith Wisa, Noel Murambi, Violet Makuto, Janet Wanja and Libero Aggripina Kundu. Kenya began the match on a low pace but slowly gained the momentum with Agala, Murambi Makuto and Wanja all combining well to give Kenya an 8-7 lead at the first technical time out. They capped up a 16-13 lead at the second technical time out before bagging the set 25-16 thanks to more points from Moim and Makuto. In the second set, Kenya took an early lead 8-0 thanks to tough services from Wanja and good blocks from Moim and Agala who made any attempts by West Africans to return the ball go in vain. The lead was extended to 16-5 at the second TTO before the coach made some changes by bringing in Jane Wacu, debutant Immaculate Chemtai and Triza Atuka for Wanja, Makuto and Wisa. The substitute took little time to settle before leading Kenya to 25-8 win of the set. The script was not any different in the third set as Murambi and Agala returned to haunt the Nigeria with their powerful attacks and hard blocks to lead 8-4 and 16-10. Munala then rested Murambi and Moim for utility player Leonida Kasaya and Evelyne Makuto. Chemtai, Atuka and Wacu combined well as they bagged points at will to lead 20-10 before they sealed the win with 25-10. The top two teams in Yaoundé will qualify to play at next year's World Championships, due to take place in Japan from September 29 to October 20.